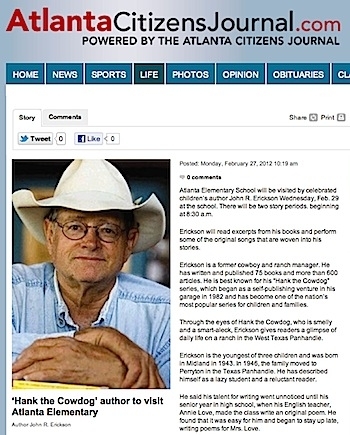 Atlanta Elementary School will be visited by celebrated children’s author John R. Erickson Wednesday, Feb. 29 at the school. There will be two story periods. beginning at 8:30 a.m. Erickson will read excerpts from his books and perform some of the original songs that are woven into his stories . . .
For more than 30 years, Erickson said he has worked hard to maintain the highest standards of wholesome family entertainment and has built a bond of trust with parents, librarians and teachers. All his stories have been approved for the Accelerated Reader Program. He has appeared in thousands of schools across the nation and is a frequent speaker at conventions of teachers, librarians and homeschoolers.